"It's a crystal. Nothing more. But if you turn it this way and look into it, it will show you your dreams." We can predict the future. We can tell that you want our latest and greatest item. And we know all this because we looked into our crystal ball. A beautifully rendered tribute to the much-loved Jim Henson fantasy classic, we are proud to present this replica of the crystal ball featured on the iconic 1986 Labyrinth movie poster. 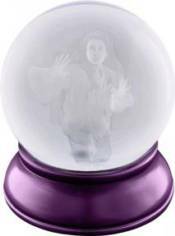 The crystal ball contains an etched image of Jennifer Connelly (the story's young heroine, Sarah) looking a little bit troubled (as you might be if you'd caught the eye of David Bowie as Jareth, the Goblin King!). 10cm in diameter and standing atop a regal purple base, this is a piece with the power to transport you far, far away. All you have to do is gaze into it.